We've had some interesting skies, lately. This shot was taken at sunrise from my back door. I love those wind chimes. •Link Murrieta365 to your post so others will know where to go if they want to join in the SOOC fun.Thanks. looks like a nice sky indeed! I like the chimes too. We have some similar but haven't been able to put them up yet..gotta wait til we don't live in an apartment I guess! Love the sight and sounds of wind chimes! 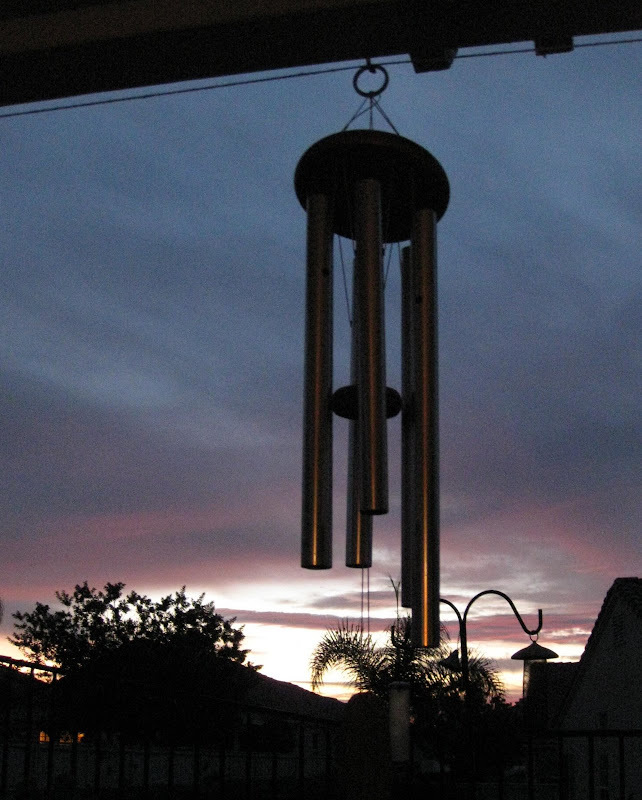 And a beautiful sky behind these chimes! I love the way the sky looks in the background. Like your blog.. and this meme. We have similar wind chimes, the sound is delightful! The colors in your sky are lovely. Great shot. I love wind chimes as well, cannot get to sleep without them. Also, what a gorgeous sky in this shot. I love the colors of the sky! I love those wind chimes...thats a beautiful shot Jan! That's a very nice morning sky and I love your wind chimes. I love the reflective color on the wind chimes. Very pretty. So I notice that 100 is coming up! Anything special planned for the SOOC milestone next week? Thanks again for a great meme. I'm all for taking it right the first time and not wasting time messing with it later.